I have always been the scouter never the shooter. Love to hunt runs in my family. This year I got drawn for Bull Moose so it was my time to shine! Trucked through inches of snow one day with no luck on the hunt. We decided after a couple of hours on the first day to head back to the truck, in an opening of 90 yards out comes my Bull Moose basically asking me to shoot him. Congratulations Lisa! 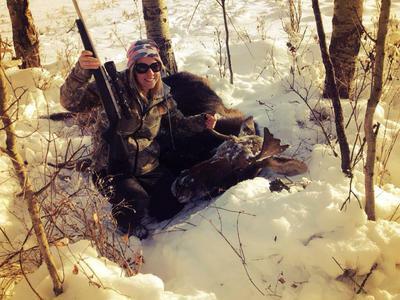 Welcome to the ranks of successful moose hunters. Having a misshapen antler just ads to the adventure and probably broadened the smile on your face. Its nice to see more and more women joining into the sport of hunting, I bet that a few of your girlfriends are jealous of you. You should try to encourage one or more of them to join you on a hunt... maybe just as the "scouter"! BTW: Can you tell us a little about your rifle? IE: What brand, caliber type of scope? How well does it shoot for you? Congratulations! I realize you were not hunting Moose at the time, and the lighter caliber worked this time, however I would still consider it an unethical kill/shot just based on caliber. It's also possible to kill a deer with a 22 rimfire! ya but there's nothing worse than seeing a moose run off wounded and bleeding and then go and die hiding were no one can find him. so now you go out and shoot another moose and mybe kill it or go and loose that one also. it's been done before. see the point . I had 2 draws Mule deer and Moose- I like my .243 and was on the hunt for my Mule. When this Moose came out in the clearly, I didnt want to pass it up cause I didn't have have a bigger gun. Obviously worked for me in Alberta - you Easterns obviously don't like to take a chance? Got my moose with .243 :) Enough said!!!! Well a 243 if your shooting him in the head every time, ya it works but it does not have the heavy knock down power needed for big game. A .338 Winchester magnum is a great gun. Moose drop in their tracks, so no loss of game. Tikka .243 - 2 shots. So exciting for me - Buck (moose)Fever, can't wait for next season!